“In contemplating the causes which may disturb our Union, it occurs as matter of serious concern that any ground should have been furnished for characterizing parties by geographical discriminations, Northern and Southern, Atlantic and Western; whence designing men may endeavor to excite a belief that there is a real difference of local interests and views. One of the expedients of party to acquire influence within particular districts is to misrepresent the opinions and aims of other districts. You cannot shield yourselves too much against the jealousies and heartburnings which spring from these misrepresentations; they tend to render alien to each other those who ought to be bound together by fraternal affection. The inhabitants of our Western country have lately had a useful lesson on this head; they have seen, in the negotiation by the Executive, and in the unanimous ratification by the Senate, of the treaty with Spain, and in the universal satisfaction at that event, throughout the United States, a decisive proof how unfounded were the suspicions propagated among them of a policy in the General Government and in the Atlantic States unfriendly to their interests in regard to the Mississippi; they have been witnesses to the formation of two treaties, that with Great Britain, and that with Spain, which secure to them everything they could desire, in respect to our foreign relations, towards confirming their prosperity. Throughout Washington’s Farewell Address, we have seen quite a few things that he warned of come true. Here, his warning of parties being founded based on location may not seem like it is a threat that we face at all. However, a quick glance at a map of the presidential election results may tell a different story. The coasts and big cities of America continue to be a concentrated location of left-wing thought and sentiment. While the heartland of America, sandwiched between the opposing coasts, remains overall staunchly aligned with conservative beliefs and opinions. The parties of Republican and Democrat are not based primarily in one location (such as the South, North, East, or West, as Washington was speaking of). You can find a member of pretty much any party wherever you go. What Washington was warning about here was identification with a part based on your place of birth or residence. Beliefs should never be espoused because of where you live, but rather should be examined and carefully scrutinized in order to find truth. Then, and only then are ideas and beliefs worth having. The next part of the paragraph, though once again demonstrates Washington’s ability to look forward and project out potential problems the US might experience. Although, perhaps this is just human nature against which Washington warns – the misrepresentation of the beliefs of others in order to gain the upper hand. Sadly, we see this all the time, all over the place. Washington was very clear that we have a responsibility to do all we can to shield ourselves from the negative effects of such underhanded politics. The unity, that quality which Washington praised, lauded, and esteemed so highly, would never be able to thrive, let alone survive under the onslaught of partisan jealousies. Even though the political parties in America do not have their own individual locality, different interests in different parts of the country are always trying to show that other interests in other parts of the country are bad, stupid, or just plain evil. It makes sense though that this would occur. If you ideas and opinions are not strong enough to be put to the test in order to gauge their validity, you must find some other way to convince people of their truth. One of the most effective ways to do this is through the use of misrepresentation of the opposing side. This serves to take the spotlight off of the potential weaknesses of your ideas and instead shine the light on the horrible consequences of the advancement of the opposing ideas. Right around the time of Washington’s retirement, those in the West were being stirred up, people were trying to convince them that those in the Atlantic states were trying to pull the wool over their eyes when it came to the treaties that were being negotiated. Washington used this current event to try and show everyone that misrepresentation was not a potential problem to be avoided, it was a current issue that they needed to guard against right now. Which brings us to today. The media is constantly spouting out stuff that has profound bias. One could argue that this bias is designed specifically to create misrepresentations in the minds of Americas. One could argue that this tactic is currently working quite well. 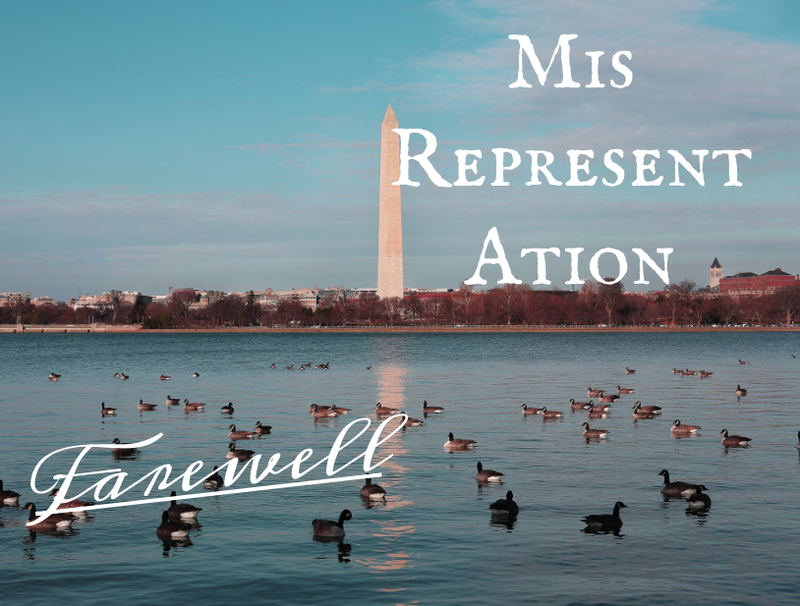 While much has changed since Washington wrote his Farewell Address, some things have not. Misrepresenting the ideas of the other side in order to prop up your own is one of those things that has definitely not changed at all. The best way to fix this problem is to be deaf to those who would try and sever us from our American brethren. When someone tries to tell you something, verify it. Make sure it is indeed true. Be on the lookout for misrepresentations (on BOTH sides). Guard against such misrepresentations. But never let the whisperings of anyone cause you to forget the necessity of unity around truth. Washington spoke of fraternal affection. The truth without love is a battle axe. Love without truth is worthless vanity.